Thanks for posting up again about this, Rich. I should have been more clear in my post; I do not use half ropes very often. If I did, the AU very well would have been my choice. does anyone have a photographic size comparison between the alpine UP, Alpine Smart, and ATC guide. I was considering the Mega Jul - but the whole broken wire/biner wear issue has turned me off on it even though its killer light. I'm in the market, and climb on all rope systems when i do get to climb these days. I'm kind of turned off by the fact that you cant rap with the UP on a single in "assist" mode. Seems like it defeats the purpose. I do a good bit of simul rapping for some reason. rock_fencer wrote: I'm kind of turned off by the fact that you cant rap with the UP on a single in "assist" mode. Seems like it defeats the purpose. Well, turn back on then, because the UP works fine with a single in assisted braking mode in my experience. (That would be a single 8.5). I sold my Smart otherwise I'd take a picture of it with the UP. 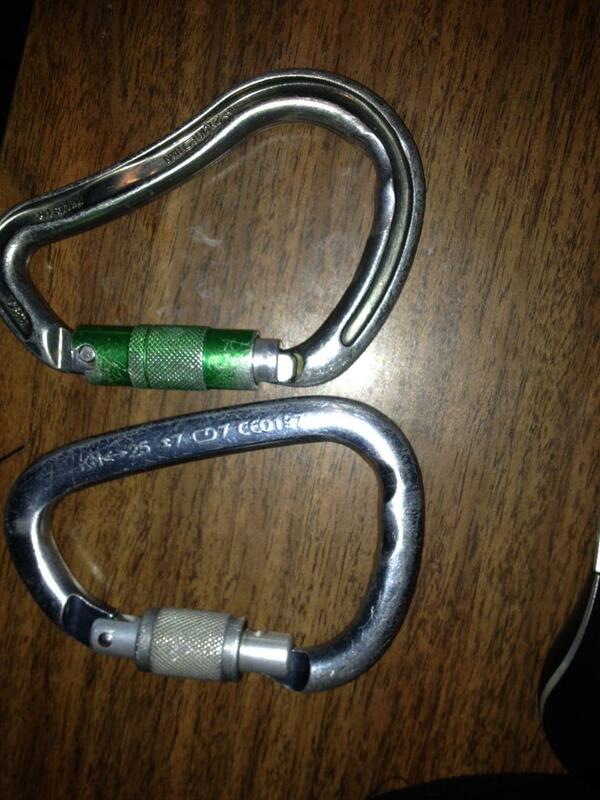 The UP is about the same size and weight as a Grigri 2 if that helps, so heavier and bulkier than the Smart and BD XP. on a side note the boa shows why you dont use those fancy UL i-beam biners for general belaying ... save those for alpine belays where weight counts ... they wear to a sharp edge much too fast and you save like what, 20-30g or so over a durable round stock biner? You are mixing up the devices. There aren't two sizes of Alpine UP, it (purportedly) handles the same range as the two Alpine Smarts. 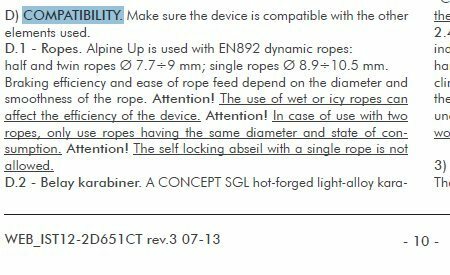 As I've said elsewhere, take the manufacturer's recommended ranges with a grain of salt (this goes for all belay devices). A conservative rule of thumb would be to take the middle third of the recommended range as providing both good handling and sufficient friction for stopping high-load falls. You're going to start giving up one of these priorities at the ends of the recommended ranges. rgold wrote: Well, turn back on then, because the UP works fine with a single in assisted braking mode in my experience. (That would be a single 8.5). ...The UP is about the same size and weight as a Grigri 2 if that helps, so heavier and bulkier than the Smart and BD XP. Thanks for the size comparison! I thought it said in the instructions not to rap on a single in assist mode. I'll look at them again. VaGenius wrote: I have a hard time seeing how an ATC and a Gigi aren't superior to the Smart, in terms of value and redundancy. Point taken that you love the thing. Next topic! theres no assisted locking for those vicious high factor falls of course !!! Please refer the section General Notes for Using, sub-section D) Comptaibility of the web manual. As I said, it worked fine for me when I tested it with an 8.5mm Mammut Genesis, fairly new. And think about it: it is supposed to catch leader falls on a singe strand. But better take their word for it. Perhaps the issue is a more Gri-gri-like tendency to release too easily and get going too fast. This is, by the way, another example of terrible instruction writing. There is nothing about this in any of the sections on rappelling. VaGenius wrote: Hey RG, thinking of using this device on a 9.1 and a 9.4, same time. Manu suggestions aside, do you see problems with this? Will you please care to write your impressions (positive or negative) of using that combination? (Again manu suggestion aside). I want to know your thoughts and reviews on giving and taking slack with that combination -Both strands at the same time either as twin (giving and taking the same amount) or as double (giving and taking more on one strand than the other). Im thinking on buying a mammut revelation 9.2 and use it with a millet absolute pro 9. Do you think that combination will work fine with both strands at the same time? Sorry, I missed this question. I don't have any experience with ropes of different diameters. However, in the universal spirit of internet advice, I won't let total ignorance stop me from giving an opinion. Which is this: I don't think it is a good idea. 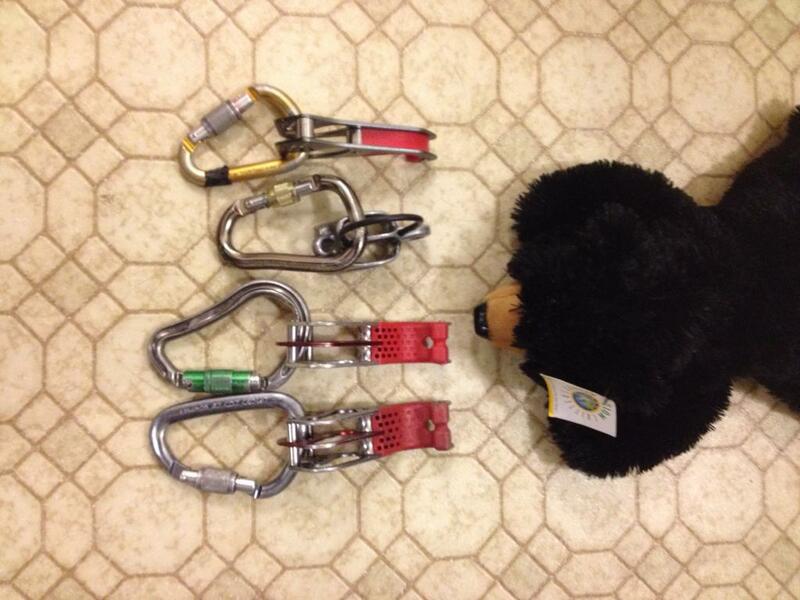 When belaying, you want the device to lock up both strands equally. It seems plausible that the bigger strand will keep the device a little too open for proper braking of the smaller strand. I have one. Have been using it quite a bit. Performance is very good. Reliable catches of leader falls, smooth rappels, and easy to use in guide mode. Used it with single and half ropes. No issues. No complaints. Only down side is that it's pretty bulky and heavy compared with my Megajul. 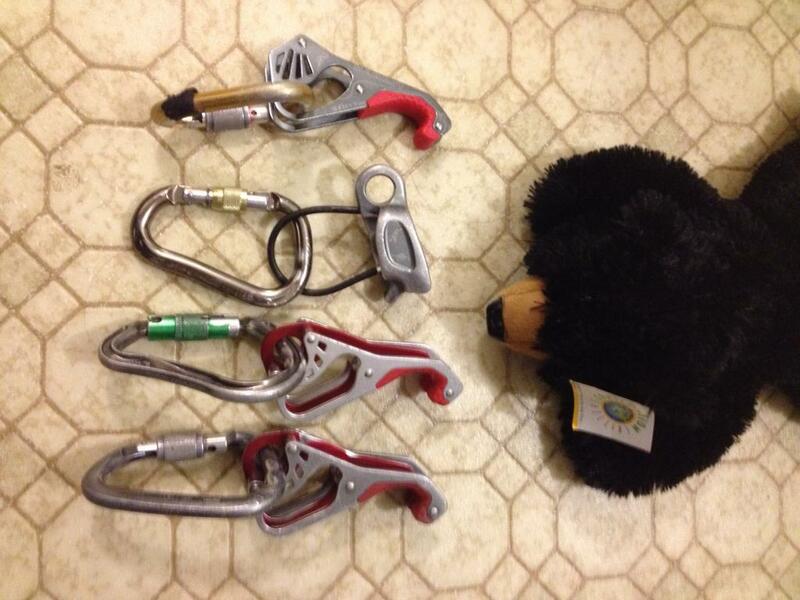 It's nice to have several different kinds of belay devices for different applications: Gri Gri for sport routes and SPI instruction; ATC Guide for climbing with others who will be carrying them and know how to use them but don't know how to use other devices; Alpine Up for adventure routes with thin ropes, two seconds, and uncertain rappel routes; Mega Jul for trips with long approaches and climbs where every ounce counts. All of these tools have their time and place. If I had to pick the best all around tool it would be the Alpine UP. Sorry to revive such an old thread but I thought it was a worthy addition before making a new thread. I have been trying different setups to laed-belay directly off the anchor in traditional multi pitch climbs (usually with bolted anchors, and some bolts for not easy to protect sections). The reason is my partner is 50Kg and I am 75Kg + full rack. So far I have tried the Munter Hitch, ATC XP and Grigri both with single and double ropes (except the Grigri of course). My favorite so far has been the ATC XP as the Munter kinking issue takes time and effort to deal with; and the GriGri may give too-hard catches for removable protection, as well as being much heavier than the other two options. Still, I would like to add an assisted breaking functionality into the system, specially for double rope technique. Has anyone tried the Alpine Up in such configuration? Or can think of any features that make it unsuitable? I have not gotten one yet as it is quite expensive and I can't imagine using it in any other scenario compared to the Grigri or ATC XP. I will try to get a unit so I can try it out. Does it lock similarly to a Grigri or allows for more slippage before locking? What happens if using only one half rope in this configuration? Also, what happened to the name of this thread?! Fran M wrote: My favorite so far has been the ATC XP as the Munter kinking issue takes time and effort to deal with; and the GriGri may give too-hard catches for removable protection, as well as being much heavier than the other two options. The GriGri definitely results in greater forces on the anchor. Removable pro might sustain these loads, but more importantly, it puts very high forces on the lead climber, particularly with fall factor 2. I'd very much encourage you NOT to use an ABD (such as the GriGri) for fixed point belay unless the manufacturer specifically allows for it. Consider a hybrid system as recommended in the paper above: fixed point belay until there is bomber protection on the pitch, then switch to ABD off the harness. Not appropriate in every case, but can leave the ABD on the rope from the start of the pitch with adequate slack out so that the fixed point belay is backed up the whole time. Derek DeBruin wrote: The GriGri definitely results in greater forces on the anchor. Removable pro might sustain these loads, but more importantly, it puts very high forces on the lead climber, particularly with fall factor 2. I'd very much encourage you NOT to use an ABD (such as the GriGri) for fixed point belay unless the manufacturer specifically allows for it. Post a Reply to "."